If a product is successful, other companies inevitably will try to supply that product. Sometimes competitors come up with a different way of doing the same thing or at least make significant improvements. Sometimes they sign a licensing agreement. In the wake of the energy crisis of the 1970s, public demand for an energy-efficient light bulb resulted in several new products. Several of these designs either stayed in the lab or enjoyed only modest success in the marketplace. Compact fluorescent lamps (CFLs) caught on, though. Twenty years of competition has led to refinements in the basic technology and a large variety of styles. Below, we will examine some of the early competitors to the CFL and a few of the variations on the theme. An early response to the problem of making a better light bulb was to keep as much of the incandescent technology as possible and to introduce specific refinements. This not only allowed researchers to draw on decades of existing knowledge to guide their work, but also meant that new designs could use existing production equipment. One design, already on the market in small numbers, simply replaced the argon gas in a light bulb with krypton gas. Krypton does not conduct heat as well as argon and slows tungsten evaporation from the filament; both factors boost lamp efficacy. An advance in gas production technology lowered the price of krypton in the 1960s, leading to special designs like the "Superbulb" from Westinghouse. Tungsten halogen lamps had been developed in the 1950s, and several designs intended to replace regular filament lamps went onto the shelf in the 1960s. Some of these designs came off of the shelf and are available today, though they are more expensive than regular lamps. Another way to boost efficiency was to recycle some of the heat produced by a lamp. Dichroic coatings, developed in the early 1960s, allowed some wavelengths of light to pass, while reflecting other wavelengths. Duro-Test Corporation introduced a spherical lamp with an dichroic coating on the inside in 1980. This "heat-mirror" technique allowed visible light to pass but reflected infrared heat back onto the filament, raising the filament's temperature. Higher filament temperatures meant better efficiency, but the lamp proved fragile and somewhat difficult to make. Duro-Test withdrew the "MiT-Wattsaver" lamp in 1988, but GE then adapted the technology by coating their tungsten halogen lamps with dichroic films. The resulting "Halogen-IR" lamps, though expensive, exceeded 30 lumens per watt. Since the early 1960s, metal halide lamps have contributed to more energy efficient lighting of large areas. In the mid 1970s, General Electric and Sylvania both began experiments on miniaturized metal halide lamps for use in the home. Though Sylvania's "Mini-Arc" (at left) apparently never made it out of the lab, GE put their "Electronic Halarc" on the market in 1981. With a high price and some operating characteristics that residential users found unacceptable, the lamp failed on the market. GE had shelved several compact fluorescent designs in favor of the Electronic Halarc, and the lamp's failure temporarily placed the company in a difficult competitive position. Fluorescent lamps represent one of the more efficient ways to make light, and attempts to make small fluorescent lamps date back to the 1940s. The internal physical properties make this more difficult than it sounds, however, and few practical designs emerged from the 1970s. As noted in our invention section, two designs that did appear on the market were the bent-tube "SL" and "Econ-Nova" designs, from Philips and Westinghouse respectively, and the bridge-welded "PL" design, also from Philips. Other manufacturers also put bent-tube designs on the market in the early 1980s. 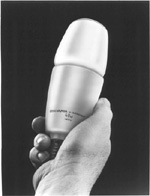 Interlectric's "U-Lamp" had, like the Philips and Westinghouse lamps, been evaluated in a late 1970s program sponsored by the US Department of Energy. The Feit Electric Co. lamp from 1986 was a variation on the bent-tube theme. These early designs used a magnetic ballast to operate the lamp, but magnetic ballasts were a major source of energy losses in fluorescent lamps. Advances in solid-state electronics allowed lamp makers to replace the magnetic ballast with an electronics package. This led to much more efficient lamps, both because the electronics wasted less energy than the magnetic ballast and because lamps operated more efficiently on high-frequency current. An early variation in compact fluorescent technology arose from a desire to reuse parts of the expensive lamp. Generally, the electrodes in a CFL would burn out long before either a magnetic or an electronic ballast. With one-piece or "integral" designs, this meant throwing away costly and still usable components. To address this issue, lamp makers produced multi-piece "modular" designs which allowed the user to replace only the failed component. These modular designs typically used tubes with new, plug-style bases so that consumers could not accidentally couple a tube with an incompatible ballast. The plug-type bases also helped address another problem that became apparent in the late 1980s. Many electric utilities, hoping to slow growth in electricity demand, distributed compact fluorescent lamps to their customers as part of "Demand Side Management" programs. Sometimes the lamps were given away free, sometimes the utilities used a mail-in rebate coupon. However, studies found that, for several reasons, many people used the CFL for a time and then removed it and returned to using an incandescent lamp in that socketa phenomena called "snap-back." Plug-type bases encouraged the sale of lighting fixtures with matching sockets. These "dedicated" fixtures would not accept filament lamps, ensuring that only efficient CFLs would be used. Of course many people were reluctant to replace entire fixtures, so designs with conventional screw bases continued to be produced. A major optical difference exists between CFLs and the filament lamps they are intended to replace. CFLs emit light evenly along the entire tube surface. Filament lamps are considered "point sources," meaning that the light emanates from a small area. Fixtures for incandescent lamps are designed to focus the light from a point source, not from the broad radiating surface of a CFL, leading to light loss within the fixture. Some designs compensate for this by including a reflector, other designs simulate the shape of an incandescent lamp as seen in this assortment of Duro-Test lamps at left. However, an advantage of dedicated CFL fixtures is that their optical properties are designed for CFLs, so little light is lost in the fixture.